This post is really late… probably because I got a REALLY AWESOME NEW JOB! I’m starting at SAVEUR magazine on Monday! SO yeah, things have been busy. Also, the weather we’ve been having in NYC is absolutely nuts… pushing 70 degrees and it isn’t even April! So I was looking for a no-fuss COLD creme fraiche recipe idea… Ina Garten’s Summer Borscht is usually made with sour cream, but creme fraiche is an easy substitute, so here I go again with yet another adaptation of a Barefoot Contessa recipe… I should really branch out at some point. Or not. 1 cup HOMEMADE CREME FRAICHE! Cook the beets in a pot of boiling salted water for about 30-40 minutes or until they are tender. Set them aside to cool reserving 1 1/2 cups of the beet liquid (make sure to strain out any weird chunks). 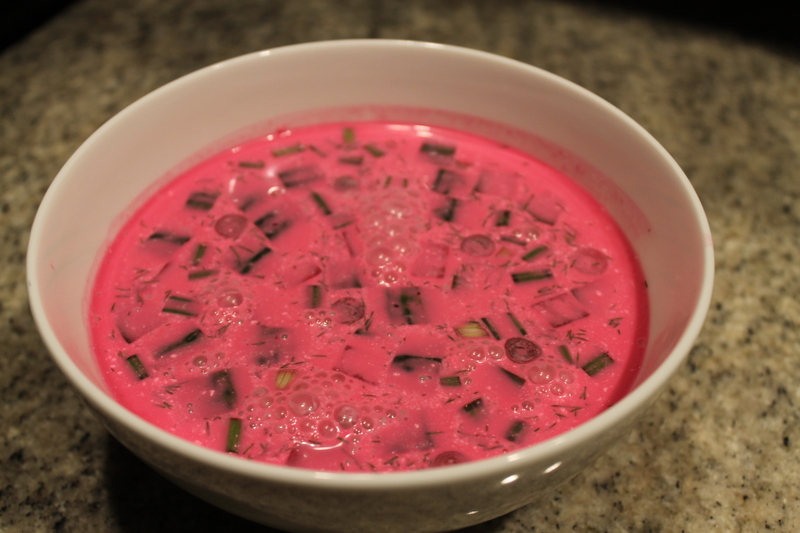 In a large bowl combine the beet liquid, creme fraiche, yogurt, chicken stock, sugar, lemon juice, vinegar, salt, and pepper. Whisk thoroughly until the mixture is smooth. Remove the skin from the beets — you can peel it off easily by hand — and dice into bite sized chunks. Add the beets, cucumber, dill, and scallions to the soup base. Cover with plastic wrap and chill for a few hours, better yet overnight. Serve with added creme fraiche and dill — it looks like a soup a Barbie might eat but it is so cool and refreshing on this balmy March day! This entry was posted in Creme Fraiche and tagged Barefoot Contessa, beets, Creme Fraiche, dill, dinner, greek yogurt, Ina Garten, soup, sour cream, summer, summer borscht. Bookmark the permalink.